Rostov the Great (Veliky) is one of the oldest Russian towns. 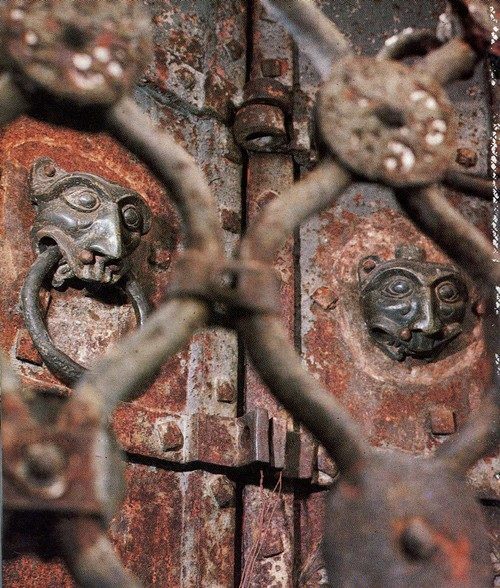 It is first mentioned in “The Tale of Bygone Years” with other Russian towns under the year 862. In fact, however, Rostov was founded much earlier. The first human settlements on this spot appeared in the Stone Age, the Neolithic period. The town is conveniently situated on the shore of large Lake Nero into which several small rivers and streams run. 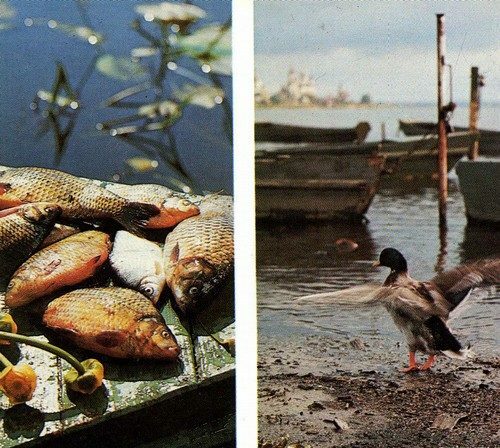 The Kotorosl, which flows out of the lake and eventually into the Volga, links Rostov with this great Russian river. Russian china. Rostov-Yaroslavl museum preserve of art and architecture. 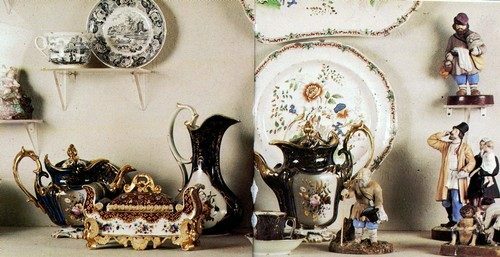 The Rostov museum has a fine collection of Russian and West European china of the 18th to early 20th centuries. Slavs began to settle here around the 9th century among the indigenous Meryane tribes. Rostov soon became one of the centres of the growing Russian state. 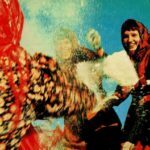 Since then this city has give the country many famous people, and many great events in Russian history are associated with it. 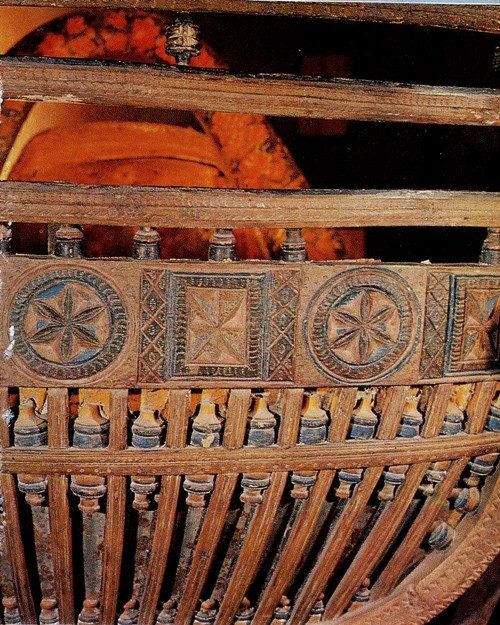 Let us recall the legendary shield of Prince Oleg of Kiev, which he nailed to the gates of the Byzantine capital, Constantinople, after the victorious Russian campaign of 907. Rostovians took part in this campaign and, under the peace treaty, received their share of the tribute from Constantinople. From the early days of Kievan Russia the name of the epic hero Alyosha Popovich has come down to us. 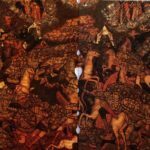 He was actually a real historical person and 7 is mentioned in the chronicles as the brave commander Alexander Popovich born in Rostov. 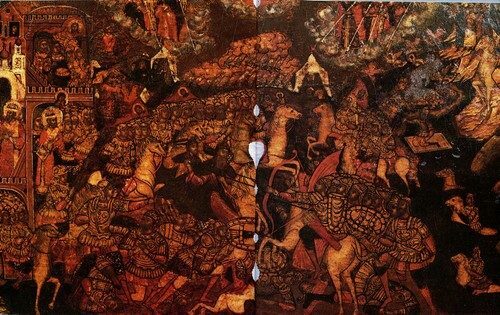 In March 1238, the year when the Mongol hordes first invaded north-east Russia, Prince Vasilko of Rostov together with his men joined in the unequal battle against the foe on the River Sit. He fought bravely, but was wounded and taken captive. 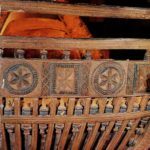 The enemy tried to persuade him to come over to their service and renounce the Christian faith, but the warrior prince remained steadfast and was tortured to death. He was canonised by the Russian Orthodox church, and his relics repose in the Assumption Cathedral in Rostov. The spirit of freedom and national honour lived on in Rostov even after the Russian lands were enslaved by the invading hordes. It was here that the first popular revolt against Mongol overlordship flared up in 1262. 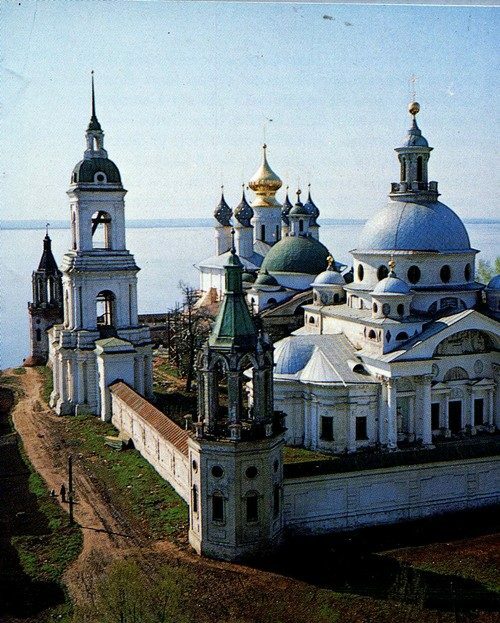 Varnitskaya sloboda in Rostov was the birth place of the young Bartholomew, later the Venerable Sergius of Radonezh, a major churchman and statesman of the 14th century, who played a leading role in the rebirth of the independent Russian state. Cathedral bell-tower. 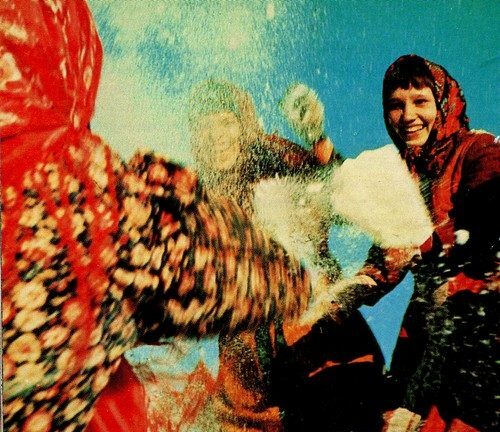 Bells. 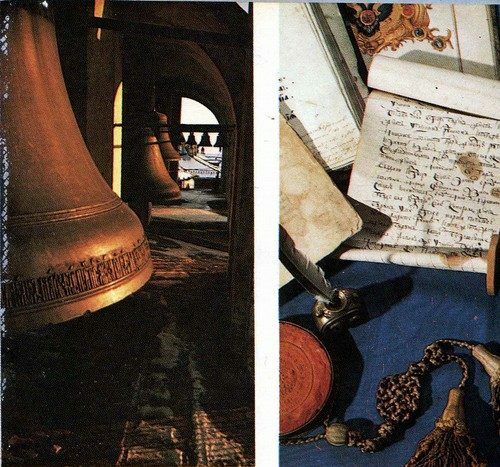 The Rostov bells are world-famous. The Sysoi is one of the largest chiming bells in the world. It weighs 32 tons and was cast in 1688 by Flor Terentiev. 14th- to 18th-century manuscripts. Chronicle-writing was carried on in Rostov. The first church school in North-East Russia was founded here. Sergius’s nephew, Archbishop Theodore of Rostov, was father confessor to Grand Prince Demetrius of Moscow. The prince naturally consulted him and Sergius on how best to fight against the Horde. It was under the influence of these two Rostovians that Demetrius decided to wage the battle of Kulikovo. Archbishop Theodore was canonised, and his relics are also in the Assumption Cathedral. But not only these two men from the Rostov land were associated with the battle of Kulikovo. 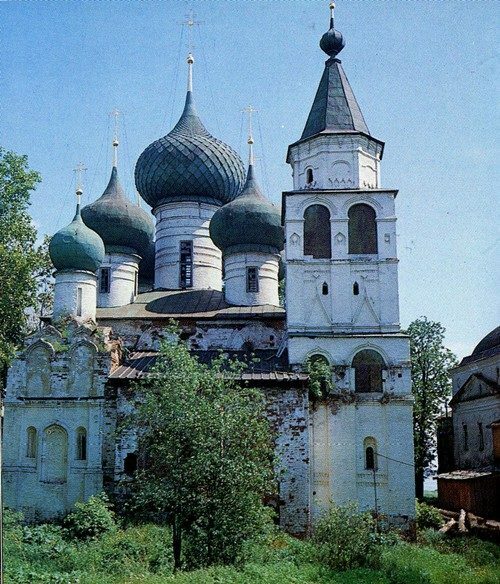 The battle was opened by the warrior monk Alexander Peresvet, who before he moved to Sergius’ Trinity monastery from whence he rode to his last battle, was a monk at the SS Boris and Gleb monastery just outside Rostov. The chronicle tells us that in the battle itself 33 boyars alone from Rostov lost their lives. And in the ranks on Kulikovo field there were even two women Rostovians, Princess Daria of Rostov and Antonina Puzhbolskaya. The first sovereign of All Russia, Grand Prince Ivan III of Moscow, was christened at the SS Boris and Gleb monastery. During his reign Rostov was one of the first principalities to surrender its independence and join together with Moscow in 1474. 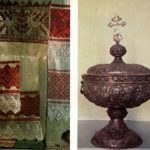 In 1552, on his way to conquer the last stronghold of the Golden Horde, the Kazan khanate, the young Tsar Ivan IV came to Rostov to take with him on the campaign a precious Rostov relic, the staff of John the Divine, which the great apostle is said to have handed to Abraham of Rostov. According to Abraham’s vita, he used this staff in the 11 th century to topple the last pagan idol in Rostov. 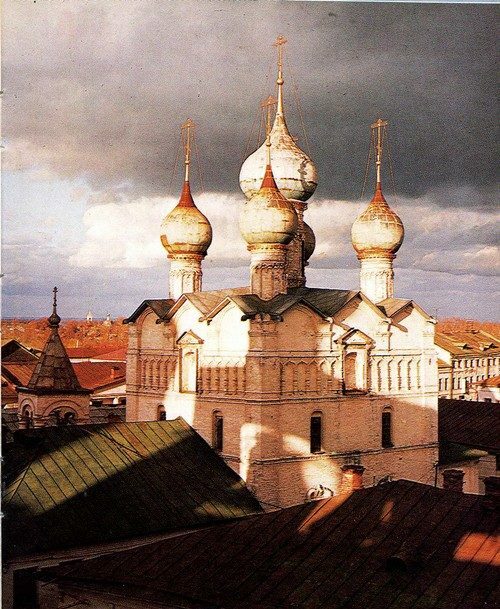 The Kazan campaign was victorious, and as a token of gratitude for this spiritual aid, Tsar Ivan erected the Epiphany Cathedral in the St Abraham monastery, which in terms of importance and certain architectural devices is the predecessor of famous Cathedral of St Basil the Blessed in Red Square in Moscow. Ivan the Terrible removed from the Rostov Assumption Cathedral a splendid jaspar floor which now adorns the interior of the Annunciation Cathedral in the Moscow Kremlin. 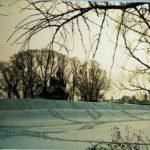 The family estate of Ivan the Terrible’s mother, the village of Ugodichi, is on the other side of Lake Nero, opposite Rostov. 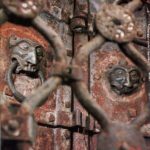 At the beginning of the 17th century, in the Time of Troubles when new invaders looted the Rostov land, some remarkable events again took place here. 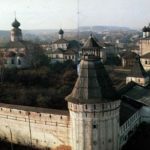 A hermit in the SS Boris and Gleb monastery, Irinarch, one of the Rostov saints, urged his fellow countrymen to fight for national liberation, and when he encountered the Polish commander Sapieha, boldly predicted their defeat. The voluntary army of Minin and Pozharsky stopped in Rostov on its way to Moscow in 1612. Another national hero of the Time of Troubles, Abraham Palytsin, was also born in the Rostov land. During these hard years for Russia the metropolitan of Rostov was Philaret Romanov, the father of the future Tsar Michael, the first of the Romanov dynasty. 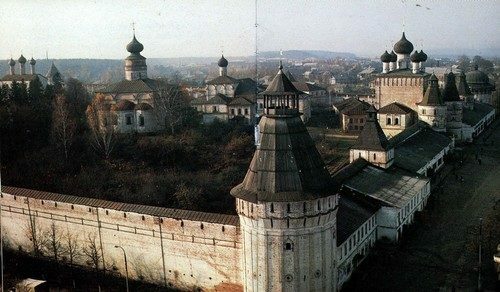 When Rostov was ravaged by the Poles in 1608, Philaret tried to defend the townspeople and was taken prisoner in the porch of the Assumption Cathedral. After his return from captivity in 1619, he became patriarch of All Russia. 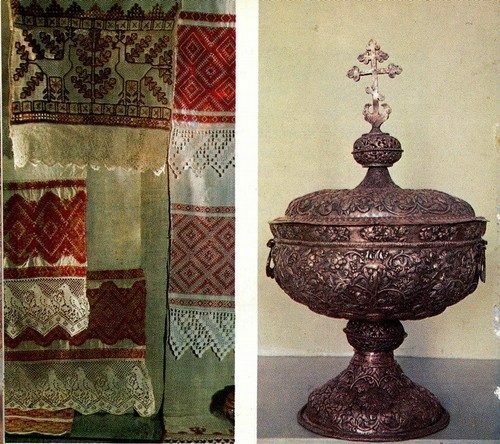 After that the Russian tsars from the Romanov 19 dynasty had a special affection for Rostov the Great and many came to worship its holy relics. In 1913 during the tercentenary celebrations of the house of Romanov the last Russian tsar Nicholas II paid an official visit to Rostov. Speaking of the patriarchate in Russia, it was Archbishop Iov of Rostov who became the first patriarch of All Russia in 1589. Metropolitan Jonah Sysoevich of Rostov is also famous. He was born near Rostov in the village of Angelovo and, thanks to his talents, reached high office in the church hierarchy. During Patriarch Nikon’s fall from favour, Jonah was locum tenans of the patriarchal throne and, if he had not expressed respect for Nikon on the latter’s sudden return from exile, would have acceded to the throne himself. Under Peter the Great the patriarchate was abolished, 24 and when it was restored in 1917 the head of the Yaroslavl-Rostov see, Tikhon, was elected patriarch. Не was canonised during the quatercentenary celebrations of the patriarchate in Russia. 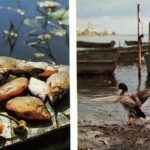 A special place in the development of Rostov culture belongs to the above-mentioned Metropolitan Jonah. 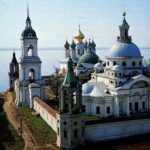 For it was under him and thanks to his initiative that the Rostov Archbishop’s Palace, which became called the Rostov Kremlin at the beginning of the 19th century and is still standing, was built in the 1670s to 1690s. Removed from the duties of locum tenans of the patriarchal throne, Jonah was banished from Moscow to Rostov. 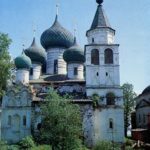 Here he embarked on some large-scale construction and, apart from the Archbishop’s Palace, many 25 churches and buildings were erected in the Rostov monasteries of St Abraham, St James, the Nativity, Belogostitsky and SS Boris and Gleb. During the reign of Peter the Great, in 1702, a Ukrainian by the name of Daniel Tuptalo, later known as Demetrius of Rostov, a most educated man for his day, became metropolitan of Rostov. Church of Our Saviour in the Market Place. Late 17th cent. The church is situated in the old market square. His activity in the sphere of spiritual enlightenment and preaching was of great importance for the church, such as his compilation, correction and publishing of the “Cheti-Minei”, the lives of the saints, on which he worked for twenty years. Demetrius of Rostov supported the reforms of Peter the Great, and the tsar had frequent talks to him on his visits to Rostov. Demetrius was canonised and is one of the most revered Russian miracle- workers. 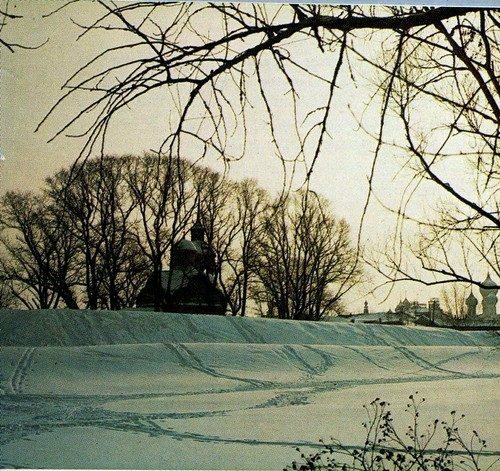 In 1788, after eight centuries in Rostov, the archiepiscopal see was moved to Yaroslavl. 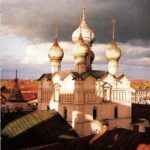 Although no longer the centre of the archbishopric, Rostov continued to remain one of the major centres of Russian spirituality and culture. 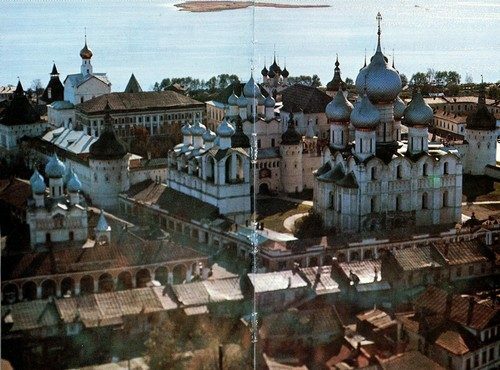 The 19th century witnessed an upsurge of interest in the past of Rostov. 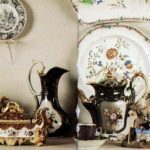 The local nobility, merchants and intelligentsia began collecting old manuscripts and icons and publishing books on local history. 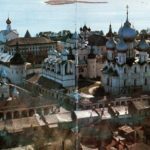 Thanks to them the Rostov Kremlin, where a Museum of Church Antiquities was opened in 1883, was saved from destruction and restored. Some eminent scholars and artists of the period served on the committee of the Rostov mu- 29 seum and gave it active assistance, such as Count A. F. Uvarov, I.E. Zabelin, D. Y. Samokvasov and V. V. Vereshchagin. Cathedral bell-tower. Bells. 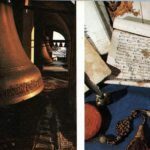 The Rostov bells are world-famous. The Sysoi is one of the largest chiming bells in the world. It weighs 32 tons and was cast in 1688 by Flor Terentiev. 14th- to 18th-century manuscripts. Chronicle-writing was carried on in Rostov. The first church school in North-East Russia was founded here.